9) Mondo Gecko: One of the Mighty Mutanimals and one of my all time favorite toys when I was a kid, this mutant gecko is certainly a visually interesting character. 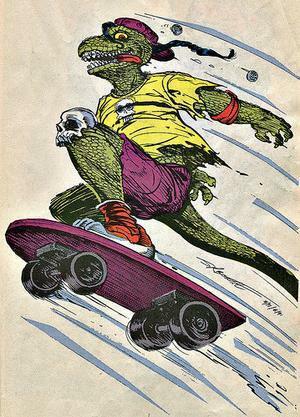 The idea of a skateboarding lizard was just about the height of awesome to my childhood self, and I have to say, it still makes me smile today. However, Mondo provides some pretty unique challenges for Freedom Force. I’ve got only the vaguest idea of how he’d work in game. He’d obviously be extremely mobile because of the skateboard, but he was never exactly a whole lot of good in a fight, even in the comics. Likelihood: Very Slim. A skateboarding lizard may very well need a new mesh, which isn’t likely to happen. 8.) Future Turtles: A long time ago I read the Archie “Future Shark Trilogy,” and it had a pretty profound impact on me. That story elevated the Turtles above the goofier side of the cartoon for me. Suddenly they were characters that deserved compelling stories, characters who could have adventures that meant something. Looking back on those issues now, they seem so much weaker than they once did, but the heart of this story is still gripping. It was my first encounter with a dystopian future, and it was a story of loss, about coming to grips with growing old. In a world of cartoons that never touched the concept of death or aging, these stories stood out. After all, how can you not love a series that gives you Raphael punching Hitler? As for the Future Turtles themselves, I’d only really want them to be able to adapt this story. Differentiating all of them from their normal counterparts would be a bit of a pain, but it could also turn out with some good gameplay. Likelihood: Very Slim. They’d be easy enough to skope, but I doubt they’re popular enough to catch an artist’s interest. 7) Ray Fillet: The Manray! This marine biologist turned aquatic mutant powerhouse was one of my favorite toys as a kid, one of my favorite characters from the comics, and remains one of my all-around favorites. I suppose it’s the coastal boy in me, but I just have a thing for aquatic heroes. 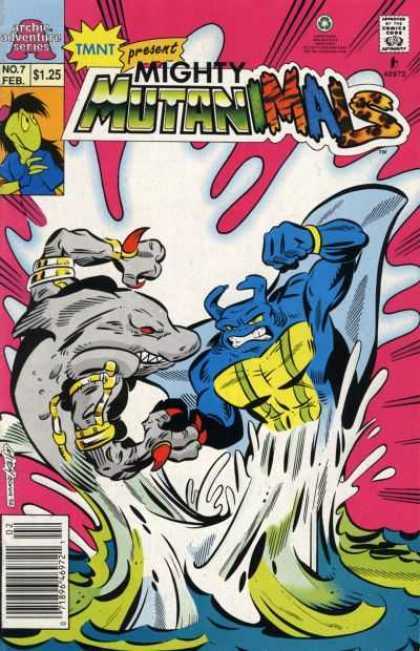 I still remember the first story about him in the Archie comics, and I was thrilled to discover that he was in the Mighty Mutanimals as well. Anyway, I always thought Ray had a great look, and his super strength based powerset would provide a nice addition to the roster of heroes available. Plus, with him onboard I’d be one step closer to bringing the Mutanimals to life. Likelihood: Slim. I don’t think he’d necessarily be hard to skope (though his “wings” might be trouble), but poor Ray is likely too obscure to bag an artist. Alright, that’s it for this batch, but come back tomorrow for another step closer to the top three! Also, please remember that I’d love to hear about your favorite characters and who you’d like to see in the mod.